An effort to update decades-old maps showed the Mount McKinley, called Denali by locals, is 83 feet shorter than previously believed. JUNEAU, Alaska — North America’s tallest peak, Alaska’s Mount McKinley, may have been taken down a notch. An effort to update decades-old maps using airplane-mounted radar technology showed the mountain, called Denali by locals, stands at 20,237 feet. That’s 83 feet shorter than an estimate of 20,320 feet from the early 1950s. 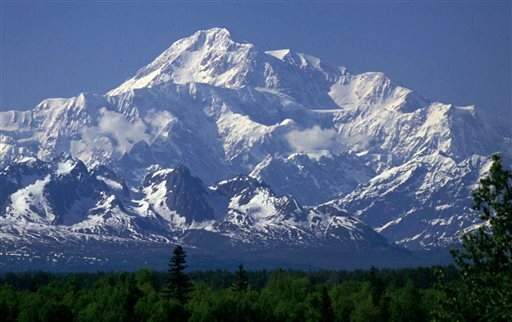 McKinley would still be more than 680 feet taller than the continent’s second-highest peak, Canada’s Mount Logan. The discovery was made in 2011, after data from a 2010 flight was processed, but details weren’t widely released until this week by Lt. Gov. Mead Treadwell, who serves on the Alaska Mapping Executive Committee. Kari Craun of the U.S. Geological Survey said the technology used in the mapping is advanced but its focus is on surveying an area, not a specific point. She said more study would need to be done, but the agency did not have plans to conduct another survey or officially change the height. Here are some facts about Alaska’s terrain, the mapping technology and the quest for accurate maps in the state. Alaska is known for its vast, rugged and, sometimes, dangerous landscape, a place where most communities aren’t connected to the road system and residents rely heavily on airplanes for travel. Many of the state’s topographical maps go back about 50 years, roughly around statehood. The radar technology is not the usual radar. It can penetrate ice and snow, Mastrodicasa said. Sensors are mounted on the belly and at the wing tips of a sleek-looking aircraft that flies at about 40,000 feet and “bombards the earth” with radar, which collects elevation data, he said. Researchers have previously thought that McKinley was shorter than the early-’50s estimate. A team in 1989 estimated the height at 20,306 feet, and a researcher at the Geophysical Institute at the University of Alaska Fairbanks reminded Fugro EarthData, Inc., the contractor that conducted the 2010 survey, that the ice and snow that cover the mountain can change from year to year, according to a Fugro report.